Coboat Pirate Beta is go! 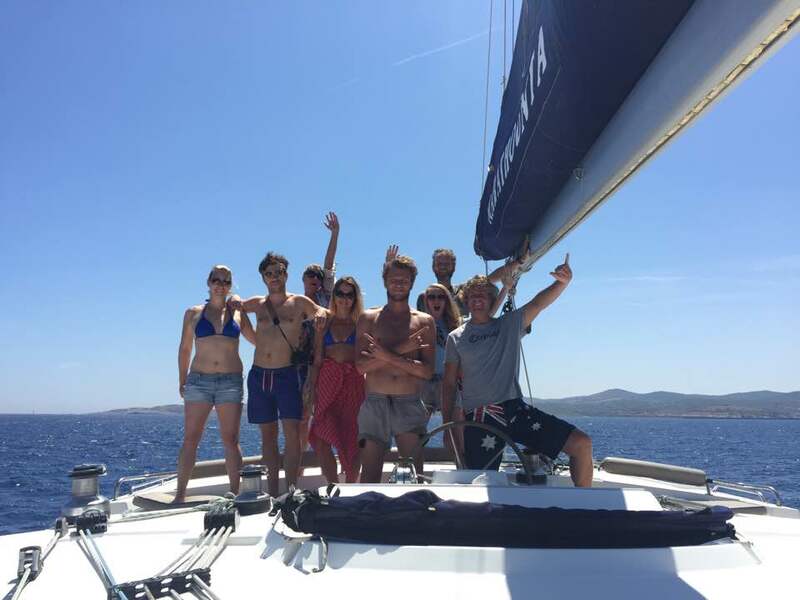 This week, the Coboat team assembled in Greece to welcome the very first Coboaters aboard for our inaugural journey. We’re now writing to you from the ocean on the world’s first floating coworking space… wahoo! 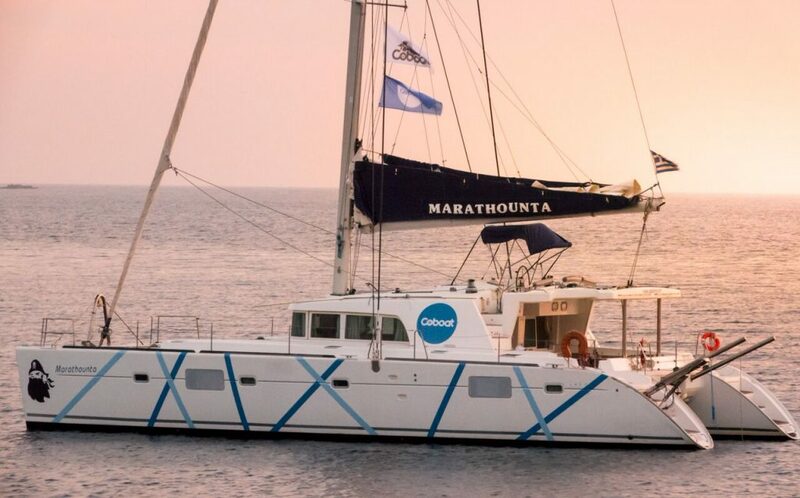 While our specially-designed Coboat is being refitted in Phuket, Thailand we’ve charted a 50-foot catamaran (a Lagoon 500) in Greece because we couldn’t wait to start sailing with our community. For the next few months we’ll be cruising the Mediterranean for a Summer of European sailing. With all guests and provisions on board, it was time to lift anchor and set sail on the first ever Coboat journey into the Aegean sea. As is tradition, we all assembled on deck with the skipper, christening the journey with the Coboat rum wish. Coboaters join the Skipper up top post-rum. Wishes included seeing some dolphins and good wind and waves for the journey! This week’s 300 nautical-mile journey saw us hopping to a number of Greek Islands, including Andros, Psara and Lesbos, onwards to the our final destination: Lemnos. Here we’d be meeting up with the digital nomad camp organised by our good friends DNX, Copass and Beta House. 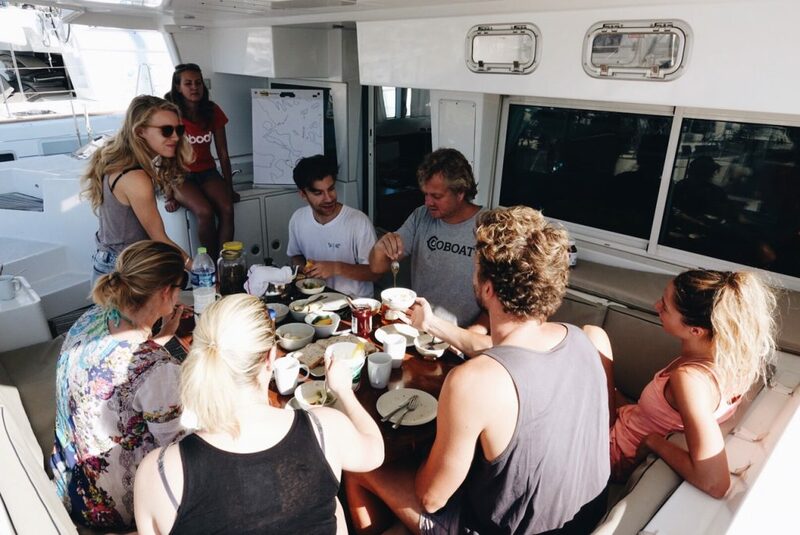 We’ve been finding our sailors legs and organising events and coworking sessions for our first group of Coboaters. Each morning begins with an exercise session and a swim. Followed by breakfast and the morning briefing of the day’s events and journey. We don’t make them walk the plank, but we do make them hold it for at least 30 seconds! The rest of the day is dedicated to working during our “Power Hours” when the Internet is strongest, and a number of onboard activities, from skills sharing, to writing the official Coboat anthem! 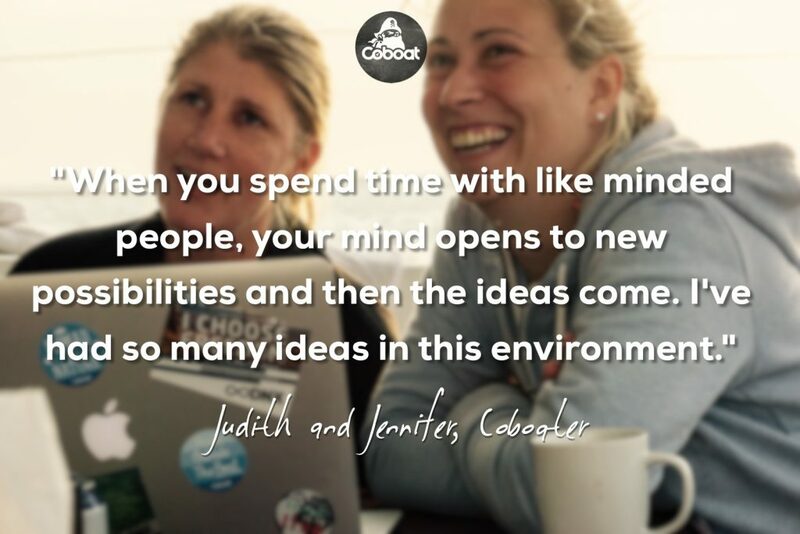 Our guest Jenny, shared her current project in one of our Coboat Idea Incubator sessions, getting tips, feedback and insights from other nomads on board. As well as plenty of productivity, there’s plenty of sailing. We were lucky enough to be accompanied by a pod of dolphins on our second day. 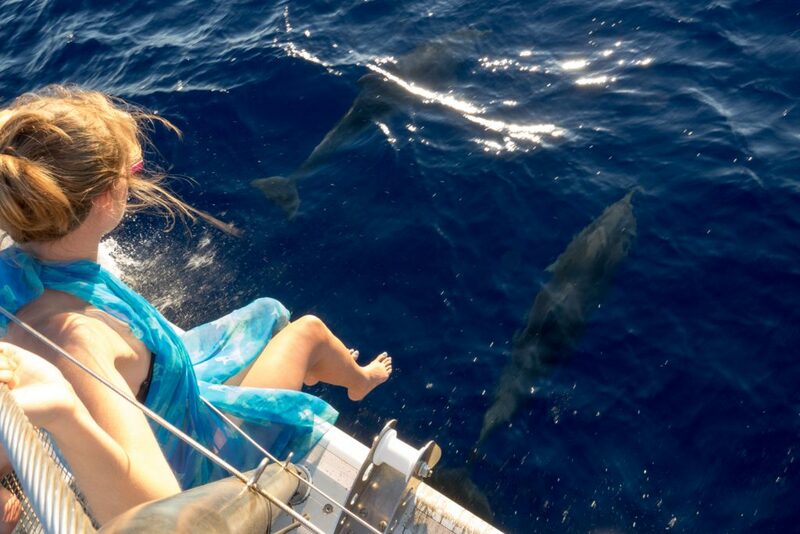 A pod of dolphins swim alongside Coboat! 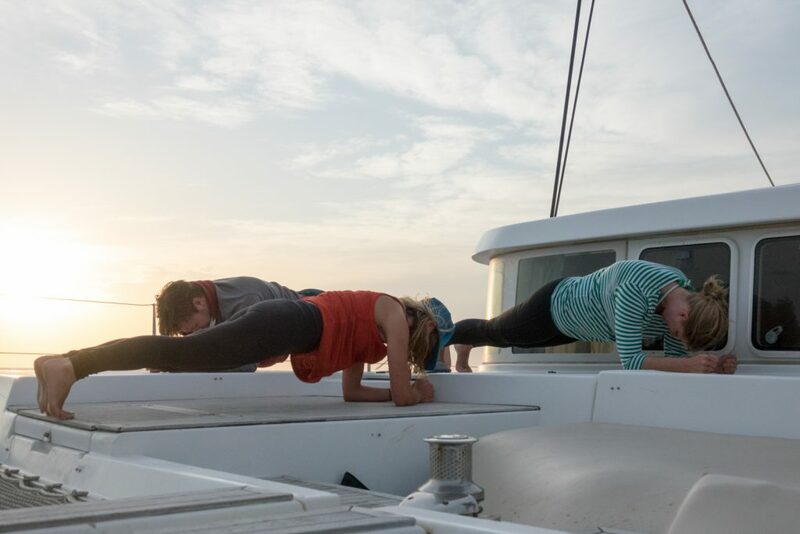 Arriving in Lemnos on Friday evening, over 40 Lemnos campers joined us on board for the first ever Coboat Sunset Cruise. 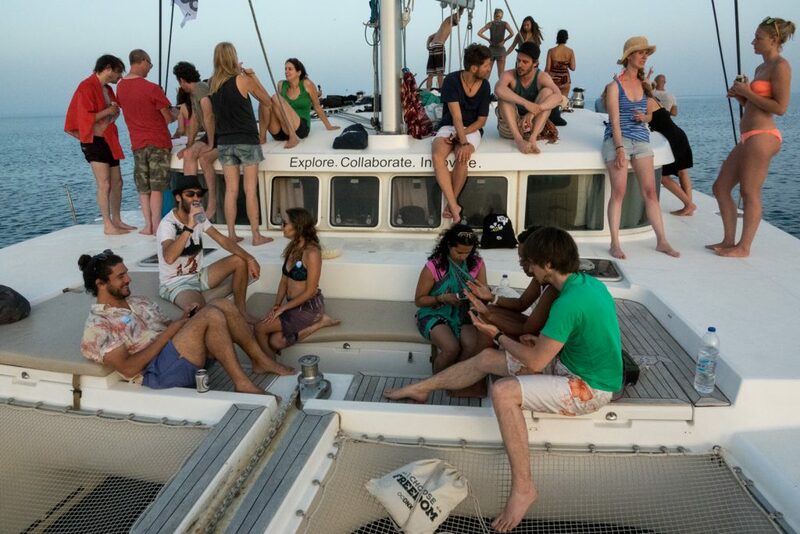 It was great to meet and share the Coboat experience with so many digital nomads from all corners of the globe. Together, we sailed along the coast, running into even more dolphins (the Coboat rum wishes really do work!). Then we dropped anchor for a swim to watch a beautiful sunset. It’s been an amazing first week, with new friends, new projects and great sailing weather. 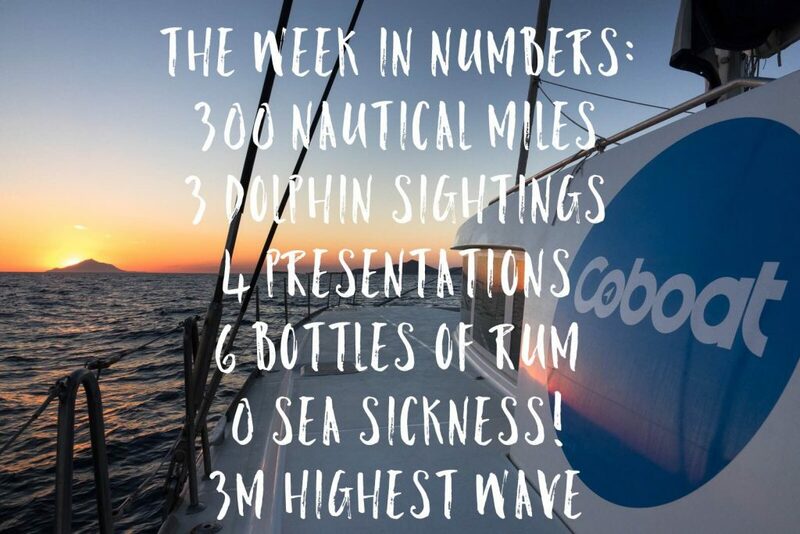 Keep following our logbook for weekly updates, and be sure to tell us where you want to sail with Coboat!